Spray Nine’s professional-strength cleaning power has been trusted by millions of professionals and consumers for over 50 years. 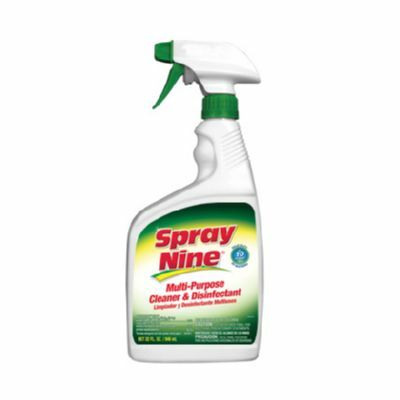 Spray Nine works hard to remove all types of dirt, grease, grime and stains. Pandemic 2009 H1N1 Influenza A (Swine Flu), Influenza A2 Virus, Salmonella Choleraesuis, Escherichia coli (E.coli), Hepatitis B & C Viruses, Norwalk Virus, Staphylococcus aureus – MRSA (HA & CA) and more! Countertops, stoves, refrigerators, sinks, tubs/showers, toilets, floors, ceramic tile, garbage pails, toys, patio furniture, tools, sporting equipment, BBQ’s, fiberglass, vinyl siding and more. Engines, tires and wheels, bug splatter, consoles, dashboards, door panels, vinyl tops, upholstery, trunks, trailers, RV's and more. Machinery, equipment, tools, motors, conveyors, vents, light fixtures, work benches, floors, walls, cafeterias, showers, change rooms, vinyl, rubber, plastic, metal and more! NSF C-1 Rated. Chairs, desks, floors, wall, commodes, urinals, sinks, chrome fixtures, countertops, tables, and more. Hoods, vents, refrigerator exteriors, stainless steel, floors, walls and more. NSF C-1 Rated.